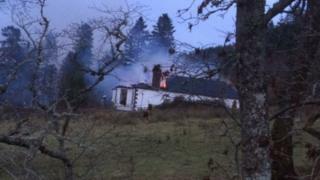 Firefighters have been called to a blaze at a historic property above Loch Ness. Crews from Foyers, Inverness, Beauly and Dingwall have been sent to Boleskine House near Foyers. The Scottish Fire and Rescue Service said a large part of the property has been destroyed. Boleskine House was owned by infamous occultist Aleister Crowley and later for a time by Led Zeppelin guitarist Jimmy Page. The alarm was raised at 13:40. Flames from the fire were visible from the other side of the loch. A fire appliance from Foyers and another from Inverness were first sent to the scene. Pumps from Inverness and Beauly along with a water carrier from Inverness, a pump from Dingwall and an incident support unit from Inverness have also been sent. SFRS said: "A large part of the property has already been destroyed by fire and crews are concentrating their efforts on the west wing of the building. "Crews in breathing apparatus are using four main jets to tackle the blaze and the incident is ongoing." Crowley, who died in 1947, lived at Boleskine House above Loch Ness from 1899 to 1913. He was infamous in the late 19th Century and early 20th Century for his promotion of the occult. During World War I, he wrote anti-British propaganda. He was also an experienced climber and was part of an ill-fated attempt to scale K2, in modern day Pakistan, in 1902. Musician Page bought Boleskine House in the 1970s because of the Crowley connection, before later selling it.